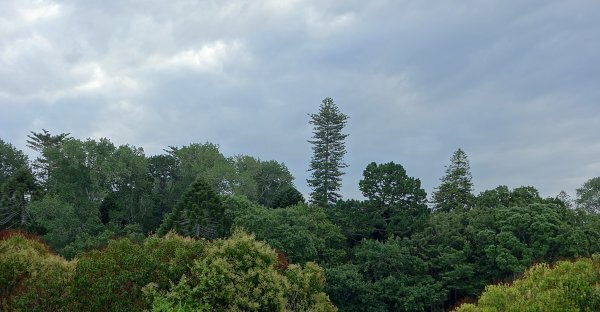 Probably the tallest tree in the Auckland Domain, this Norfolk Island pine towers over the Araucaria plantings on the Parnell side of the domain, near the site of the Parnell Railway Station. The tree is only a few metres away from AR/1242. Height taken between highest visible top from path, and base of adjacent tree on same grade, as the base of the tree was obscured. In fine health with a complete top, unlike many of the neighbouring A. heterophylla. Below the Domain Walk track, north of the Parnell entrance to the Domain. A few metres away from AR/1242, in the northern part of the Ararucaria plantings. The best view of the tree is from Cheshire St in Parnell.